The T’moan people literally live in the middle of nowhere. They are 50 km (35 miles) to the closest village in any direction. They are 80km to the nearest road. They are surrounded by jungle. After years of logging by the military, some is getting quite thin, but there are still some areas that the trees are so big and tall that they block out the sun. The other day I was going back to visit the T’moan tribe and it was the first time I had attempted to take my truck instead of the normal motorcycle. The dry season this year has been especially dry and so I assumed that most creeks and rivers that we needed to cross would be dry so I could potentially drive right to the village. I wanted to take my vehicle because I could carry much more food and equipment. This time I wanted to take the village iodized salt because most of the T’moan have iodine deficiencies which can cause many health problems, not the least of which are large goiters (or tumors on the neck). I have seen some goiters the size of volleyballs and weighing more than ten pounds. The only “cure” once a person gets a goiter is to have surgery; however, it can be prevented simply by using iodized salt. Simple. So this time I took enough salt for every family to have one kilo (2 pounds) of salt. Back as little as fifty years ago salt was as valuable as gold in the remote tribal villages, even now it is extremely hard to come by. The people had never had iodized salt before. On the day we drove to the tribe’s main village we had no trouble, other than the constant jerking of the vehicle over the uneven jungle floor. Most of the ground was just dirt and uneven trails, making it hard to drive, but not impossible. There were sections of boulders or exposed tree stumps which are the most destructive to vehicles. I was careful to drive very slow all day long and avoid hitting any rocks or stumps. I only high centered the vehicle one time because I was not paying attention for a split second. After only a few minutes of pushing and shoving though, we were able to release the vehicle and keep going. We spent a few wonderful days in the T’moan village teaching the people more about Jesus and fellowshipping with them. Though it was quite hot when we were there, we could soak in the river of God in the evening and cool off. At night, the temperatures dropped significantly. Our last evening there I did not sleep well. We only had dried wild cow meat to eat as food and it looked and tasted very moldy. We cooked it as best as we could, but the putrid smell of the meat was a sign to me that the meat was already spoiled. That night, about midnight the evidence came suddenly. I ran as fast as I could for the woods, not making it all the way, but close enough. After relieving myself, I returned to the house we were sleeping in. I had only laid down a moment when the stomach rumblings hit me again. I tried to move quickly to get out of the house and made it only to the bottom of the flimsy ladder acting as the entranceway into the house. From then on, every few minutes, my body was purged of everything it did not appreciate! (I’ll spare you any more graphic details). By four in the morning I was exhausted and felling a little better when the village started to wake. By five in the morning, the first light was coming over the eastern horizon and the whole village was sitting around campfires to keep warm in the early morning light. By six our team decided to head off. I knew it would be a tough day, but fortunately there is one benefit from being 50km from the next village: you don’t have to go very far to find privacy behind a bush! We said our goodbyes in the village and promised to return in a few months. We headed out, quite refreshed and mentally prepared for the rough journey ahead. Each one in the vehicle was sharing about the fun things we had done and seen over the last few days. 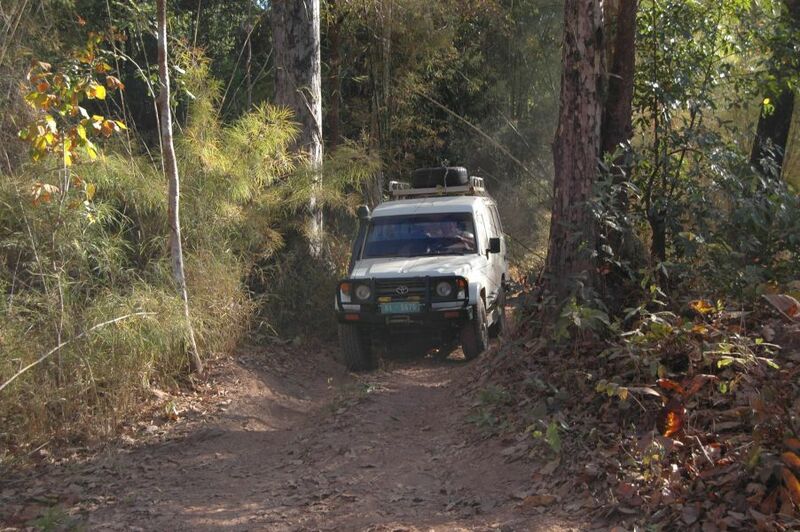 I was only driving in first gear and we slowly crawled along the uneven ground. We were probably about seven kilometers outside the village when all of a sudden. Crash! We were going slowly, but we had hit something which caused us to freeze in our tracks and lurch upward. I thought we had simply hi-centered the vehicle again on some dirt in which case we would just push it off and keep going. As I got out and looked toward the back of the vehicle I realized we had a serious problem. The wheels were not where they were supposed to be. They had been completely ripped off! We had hit a tree stump which was hidden in the grass. We only missed clearing the stump by less than a width of a finger. While the stump appeared small, at only about 20cm across (8 inches), it was attached to an extensive and hardy root system. The stump did not give. The axel of our truck did. The springs were ripped off, the drive shaft severed and both wheels were lodged into the body of the truck. The wheels were no longer attached to the vehicle! Now we had a problem. The monkeys had not yet set up an AAA automobile repair service yet. There is no emergency police number to dial and no cell phone coverage within fifty kilometers. Over my years in Cambodia I have fixed a lot of things, but as I looked at this I had nothing to say. I knew we were in big trouble. We were in the middle of nowhere and there was no way to get help. The only thing I could do was pray. Note: The last installment of this story will continue to tomorrow on this blog site.